Offshore drilling is an extraction technique which allows companies to access oil deposits under the ocean floor What is Offshore Oil Drilling? Accessed 5.17.2015. http://www.wisegeek.com/what-is-offshore-oil-drilling.htm What is Offshore Oil Drilling? Accessed 5.17.2015. http://www.wisegeek.com/what-is-offshore-oil-drilling.htm . Offshore drilling sites are typically situated over the continental shelf, although advancements in drilling technology have made platforms even further out to sea economically and physically feasible. Offshore reservoirs can be identified through 3D seismic surveys, which scan the seabed to understand the rock formations. Sound waves are sent, received and decoded from the survey vessels to create 3D images, which depict the oil and natural gas pockets hidden between the porous rocks underneath the sea National Energy Technology Laboratory. “Deepwater Technology”. Accessed 5.17.2015. http://www.netl.doe.gov/research/oil-and-gas/deepwater-technologies National Energy Technology Laboratory. “Deepwater Technology”. Accessed 5.17.2015. http://www.netl.doe.gov/research/oil-and-gas/deepwater-technologies . Drilling barges: Utilized for shallow water drilling in calm water conditions. Drilling equipment is placed on to the barges’ decks and towed to the site by tugs. Anchors hold the barges in position where drilling is to be carried out. Jack up rigs: These drilling structures are positioned onto the site by lowering and rooting their three or four giant legs on the sea floor. The barges are then lifted up above water. They are more stable than the floating rigs and are therefore able to drill up to 100 meters. Submersible rigs: These rigs are pontoon based which allow for water ballasting and de-ballasting in order to position, anchor and re-float the massive structure. 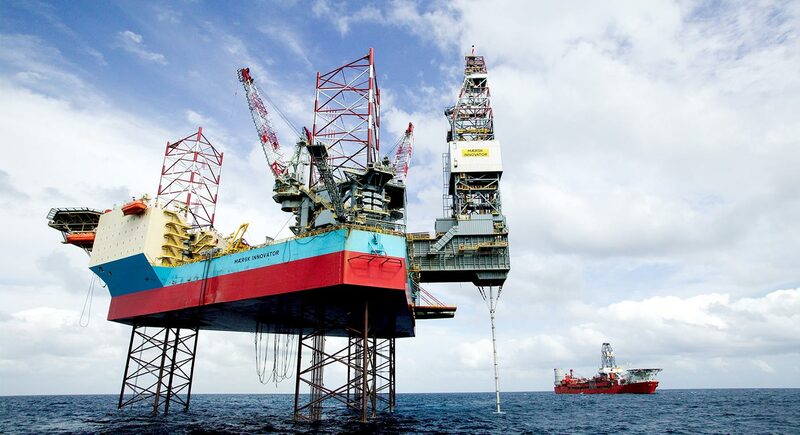 All necessary drilling equipment is fitted on the platform’s deck, similar to the drilling barges and jack-up rigs. Their operations are limited to shallow waters due to their submersible design. Semi-submersible rigs: A Semi-Submersible rig is a Mobile Offshore Drilling Unit better known as MODU, which is designed for offshore drilling in ultra-deep waters of the oil and gas rich areas across the globe. They are partially submerged in water during drilling operations and are normally moored to the sea bed by anchors. Drill ships: Maritime vessels modified to drill wells in oil and gas fields. They are adapted to provide complete offshore drilling solutions. Drill ships are fitted with expensive machinery and drilling equipment, which are similar to the ones fitted on any other drilling unit. Since they are required to work in ultra deep water areas ranging up to 3000 meters, all supplies and equipment are catered by the offshore work boats. The drill ships have a drilling deck and are equipped with a moon pool, and are somewhat similar in design as the other drilling units. The drilling equipment that passes the moon pool is connected to the ‘sub-sea well’ via the ‘riser pipe’ (which is flexible to some extent). Offshore drilling processes offer access to previously untapped oil reserves. The access allows some nations to rely on their own reserves rather than importing, or even exporting, oil. This in turn improves the energy independence of nation states that have few onshore resources. Offshore drilling can be extremely dangerous. Several accidents have caused rigs to explode, capsize, or become badly damaged, with accompanying loss of life. Severe weather conditions, problems with the rig, and potential dangerous geological conditions, are all challenges to the offshore drilling process. The environmental effects of offshore drilling are primarily caused by pollution related to poorly maintained and operated rigs. Oil spills around rigs are common, especially at the seafloor, where drilling may stimulate seepage of both oil and potentially heavy metals. Offshore oil drilling also disrupts the ocean ecology where the drilling is located. Finally, the aesthetics of the rigs off the coastline are an issue for neighboring communities. Sorry, we do not yet have a video specifically for Offshore Oil. We are adding new videos to StudentEnergy.org weekly, but in the meantime check out this video on Oil.